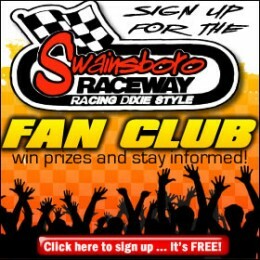 By admin Comments Off on Double Showdown at Swainsboro Raceway! Double Showdown at Swainsboro Raceway ! 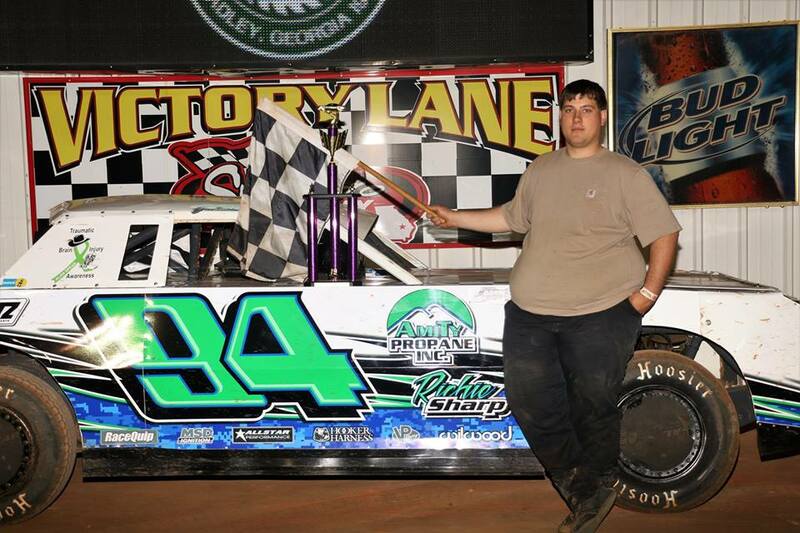 With weather threatening all around, track owner Paul Purvis rolled the dice and took a chance at Swainsboro Raceway. 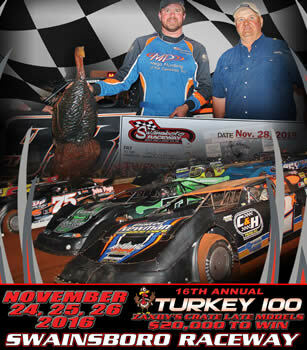 Hosting two days of ground pounding racing action feature the Schaeffer’s Southern National Super Late Model Series both Friday and Saturday night drivers rolled in from as far as the Australian Outback. 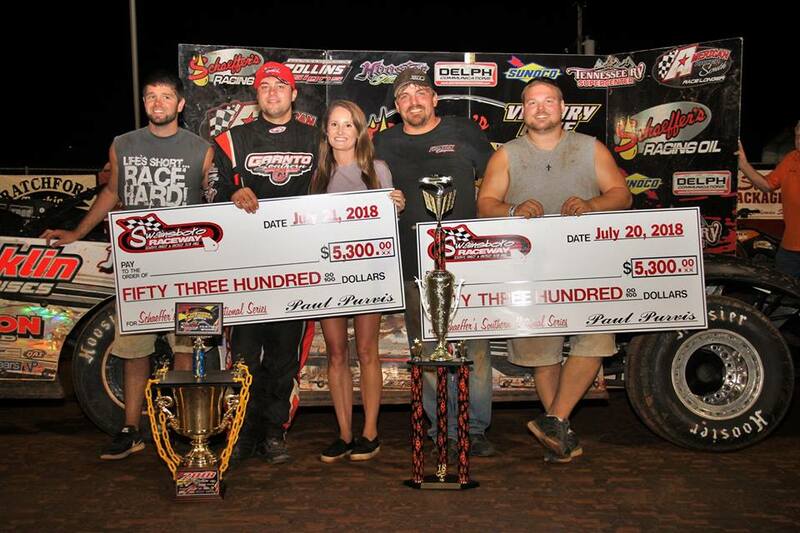 Friday night drivers and fans enjoyed a complete show with qualifying, heats, and 53 lap feature event in the Schaeffer’s Southern National Series. 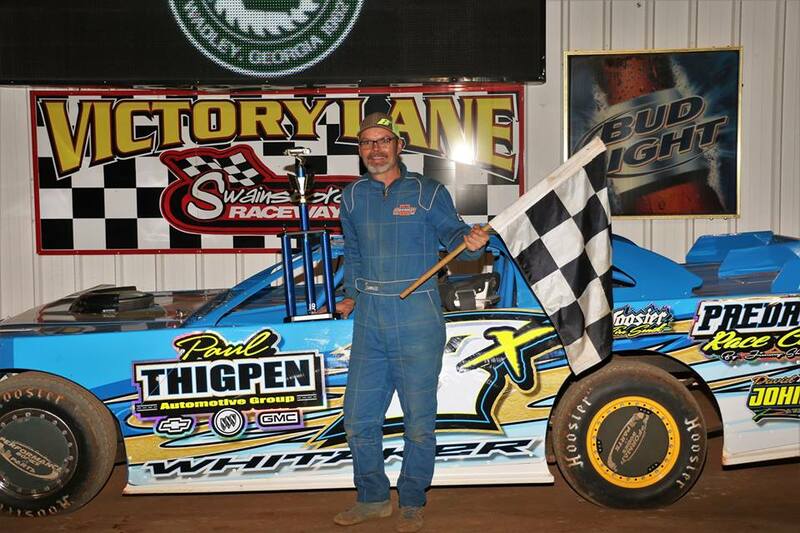 Known as one of the locals, dominating the dirt tracks across the U.S. over the past year, Young Gun and The Wheelman Brandon Overton made last minute charge with only six laps to go picking up back to back $5300 payday. 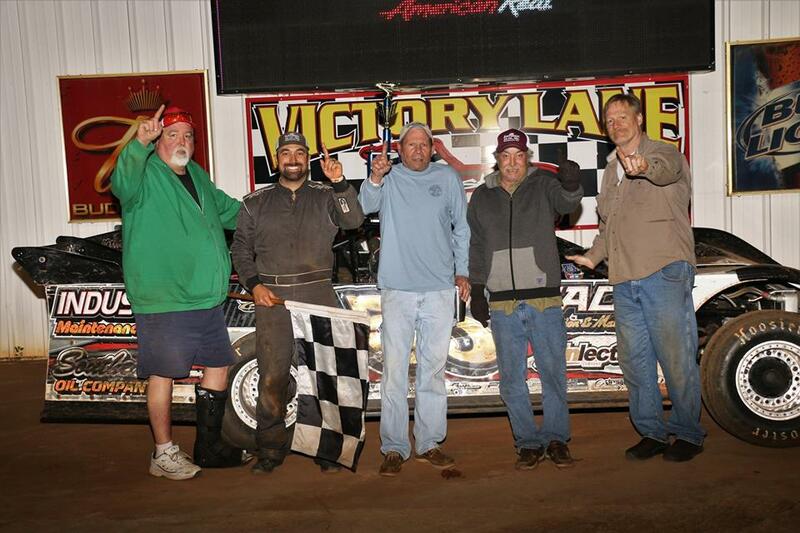 For the second night in row, Casey Roberts fell a few laps shy picking up second again with Dale McDowell third. 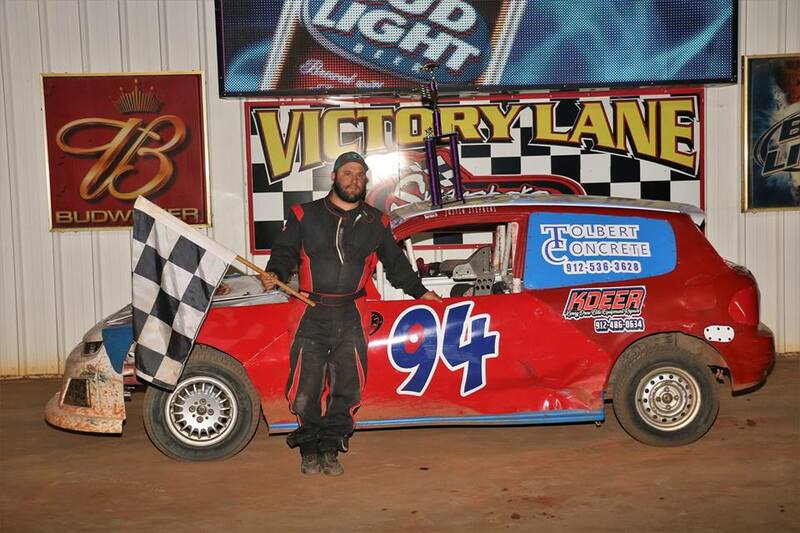 Drivers in Sunoco Super Street, Daniels Chevrolet Pure Stock, Roger Wheeler Construction Road Warrior, and Scare House of the South 440 competed in heat race events to set the field for Saturday’s $1000 feature event. Saturday evening, beautiful skies and cool breeze filled the air as 126 cars packed the fields for 8 classes of racing action including another complete night of Schaeffer’s Southern National Super Late Models, Zaxby’s Crate Late Models, and Southland Insurance 602 Sportsman. The first feature event of the night was the Sunoco Super Street division as Richie Stephens and Monk Gulledge picked up heat race wins Friday night leading the field to green. Stephens takes the lead off turn one followed by Gulledge and Bobby Oglesby. Lap 3, Luke Scott closes in and tries the inside of Oglesby off turn two for third. Lap 5, Scott forced to pit with flat. Lap 6, Justin Sapp battles Jimmy Maness for the fourth position. Lap 8, Tommy Clinard forced to pit loses his top five. Halfway, Gulledge closes in on Stephens for the lead. Two to go, Gulledge gets underneath Stephens as they swap paint for the lead. Taking the white flag, Stephens stuck on the outside off turn two gets off the high side fighting to save it coming to the checkered. Both Gulledge and Stephens out the groove in three, Bobby Oglesby takes advantage to take the lead in the last turn. Bobby Oglesby picks up his first win of the season, Jimmy Maness grabs second, Brent Herndon third, Jason Harrison fourth, and Monk Gulledge fifth. In the Daniels Chevrolet Pure Stock division, local boys battled it out at the green with Roger McKenzie and Gene Thompson sitting front row. McKenzie jumps out front for an early lengthy lead as Thompson falls back on the outside. Four wide for second, George Williamson takes the position. Lap 3, Wrightsville bandits Brent Herndon and Kip Poole battle for third. Lap 5, Alex Sturkie makes it a three car battle for the third position. Roger McKenzie checked out adding another win for the season, George Williamson second, Kip Poole third, Brent Herndon fourth, and Alex Sturkie rounded out the top five. After saluting fans four-wide, Schaeffer’s Southern National Super Late Models took the green for 53 laps $5300. Outside taking the lead in one, Brandon Overton dominated for the third straight night leading the entire event celebrating a three day total of $15,900. Starting pole position, Ross Bailes held onto take home second and Dale McDowell third. Making his first appearance at Swainsboro Raceway, Clay Harris earned the fastest time over Ben Faircloth in the Zaxby’s Crate Late Model division. Twenty-three cars took the green for 25 laps paying $2000 to win. Proving the outside lane was the way to ride, Ben Faircloth rolled into first. Joshua Bishop moves into the second position by Harris. Five to go, Faircloth gets into lapped traffic allowing Bishop to close the gap. Coming off four, lapped cars blocking the line, Faircloth took the high side and Bishop bottom to battle for first. 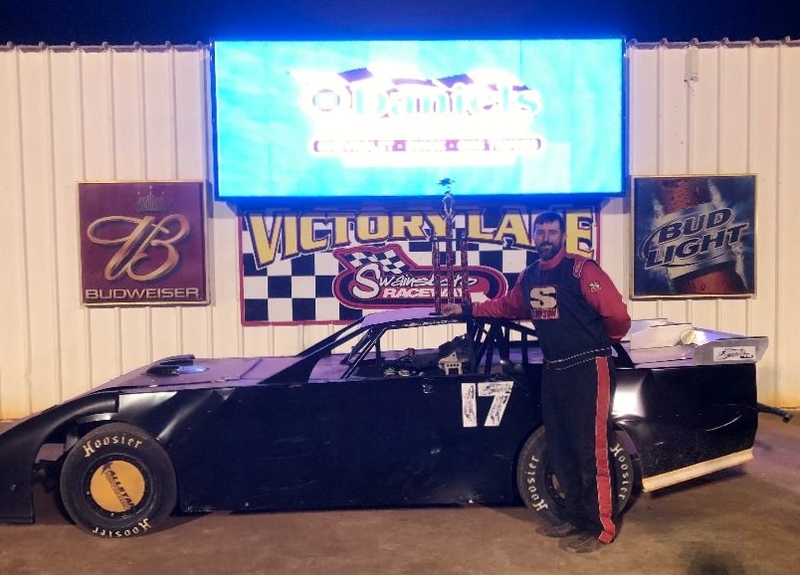 Ben Faircloth snatched the win moving into victory lane for the first time this season, Joshua Bishop second, Clay Harris third, Chesley Dixon fourth, and Jimmy Thomas fifth. In the Sharp Mini Late Model division, Richard Johnson and Brad Amerson picked up heat race wins. On the start, Amerson takes the lead off two but Johnson comes back in three to take first. Lap 3, Johnson pulls a huge lead as Gavin Cowan moves into second. Lap 6, Ricky Woodward move to third inside turn four. Two to go, Cowan closes the huge gap on leader Johnson. Coming to the checkered, 11 year old Gavin Cowan takes the lead off turn four earning his first win at Swainsboro Raceway. Finishing out the top five Richard Johnson second, Ricky Woodward third, Rene Chamser fourth, and Brad Amerson fifth. Qualifying fastest time in the Southland Insurance 602 Sportsman division, Dale Timms sat inside Rocket Man Richie Stephens. Timms claims first in turn one with Stephens second. Lap 5, after pitting early Cody Overton moved back into the fourth position and works on Ricky McClain for third. Dale Timms grabs his first win at Swainsboro Raceway, Richie Stephens second, Ricky McClain holds off Cody Overton for third, and Blake Craft finishes out the top five. The Roger Wheeler Construction Road Warrior division rolls out the seventh feature event of the night with Tyler Sanders and Kip Poole front row. Sanders takes the lead with Graham Stevenson putting the pressure on Poole for second. Lap 5, Poole forced to pit with a flat. Luke Scott running in the second position with Stevenson third. Scott closes in on Sanders lead but unable to make an attempt for first. Tyler Sanders returns to Victory Lane, Luke Scott second, Graham Stevenson third, Jacob Barwick fourth, and John Lariscey fifth. Seventeen Scare House of the South 440 drivers rolled out with Rod Morris and Cody Atkinson up front. Morris quick shifts to the lead with Justin Stephens in second. Stephens tries inside moves but fails to complete the pass. Rod Morris returns to Victory Lane for the fifth time this season, Justin Stephens second, Cody Atkins third, points leader Tyler Davis fourth, and Richie Green earns a top five. 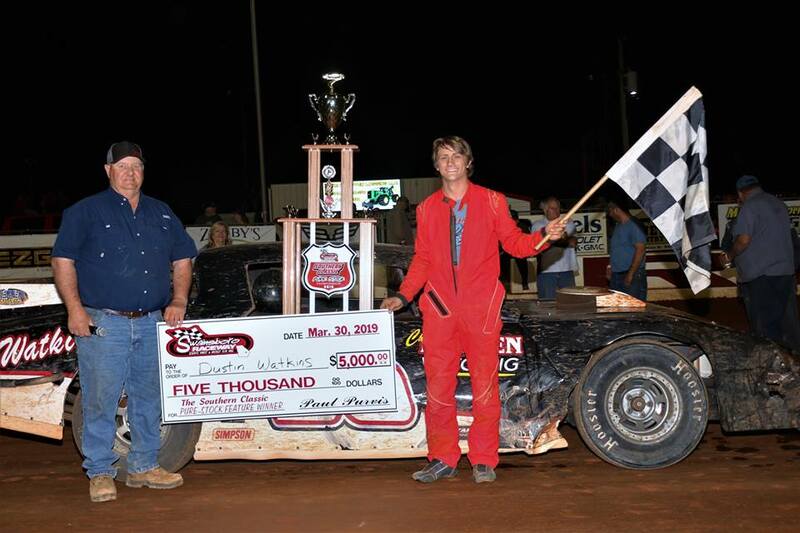 Swainsboro Raceway and Budweiser presents the Swingin’ Medallions Friday, August 3. Saturday August 4, racing action will resume with make-up races from previously rained out event.